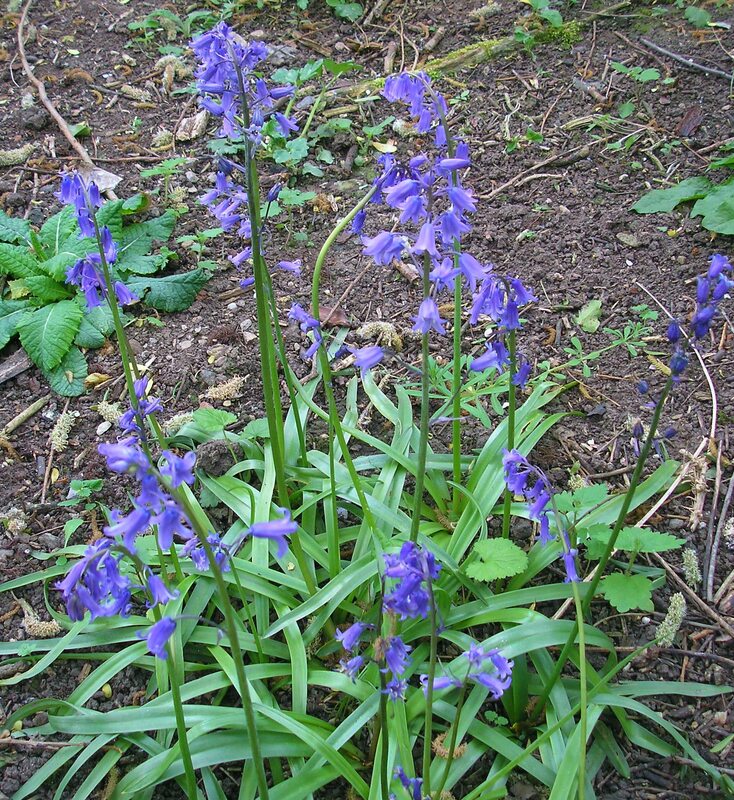 The patch of English bluebells MCT introduced at the end of the west bund last autumn did reasonably well in May this year, as Pam’s photo showed. We have just expanded this area, improved the dappled shade by pruning excessive overhanging willow branches and reduced the area of ground elder and nettles slightly. 400 extra bulbs were planted at the end of August. The extra light seems to have confused the primroses in the area, which have started to flower again! 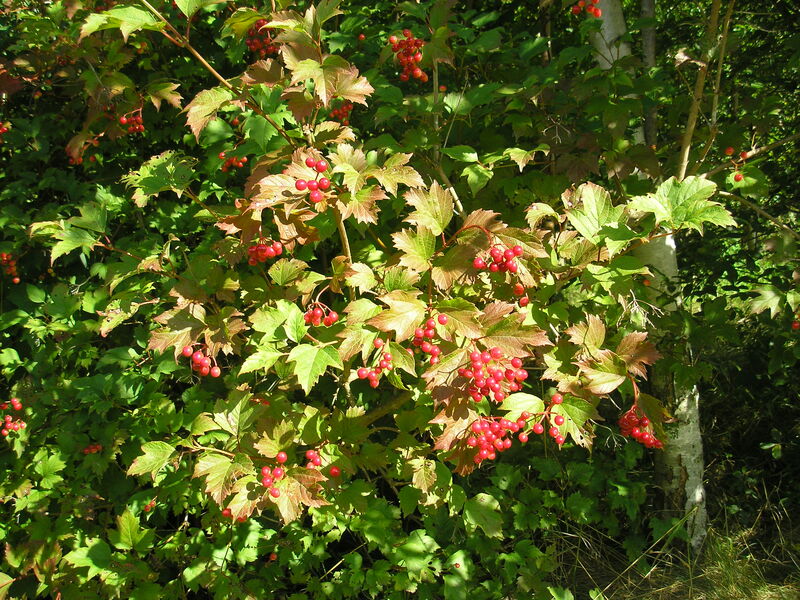 It would have been really nice to end July/August’s post with Pam Brown’s photo of beautiful early Autumnal colouration of the Guelder rose. 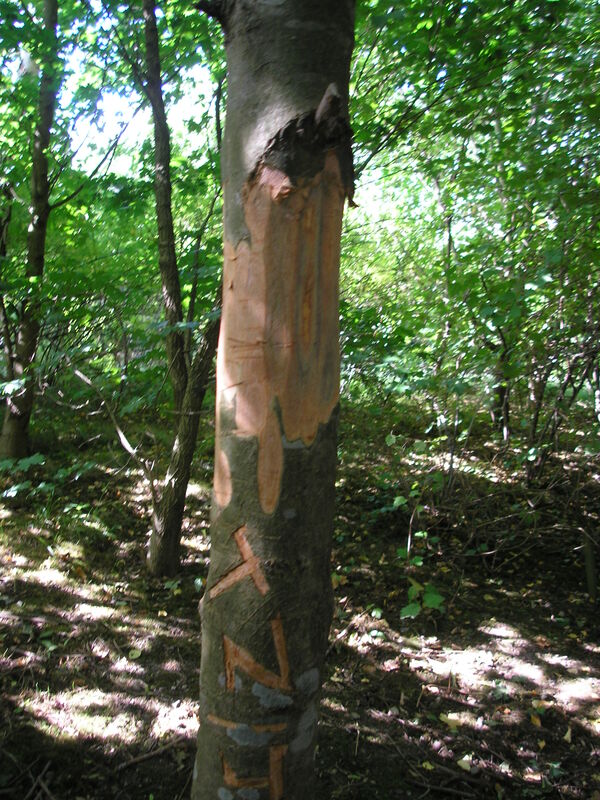 Sadly however we also have to show examples of the mindless vandalism that recently occurred in the wood behind Hobmoor Terrace. 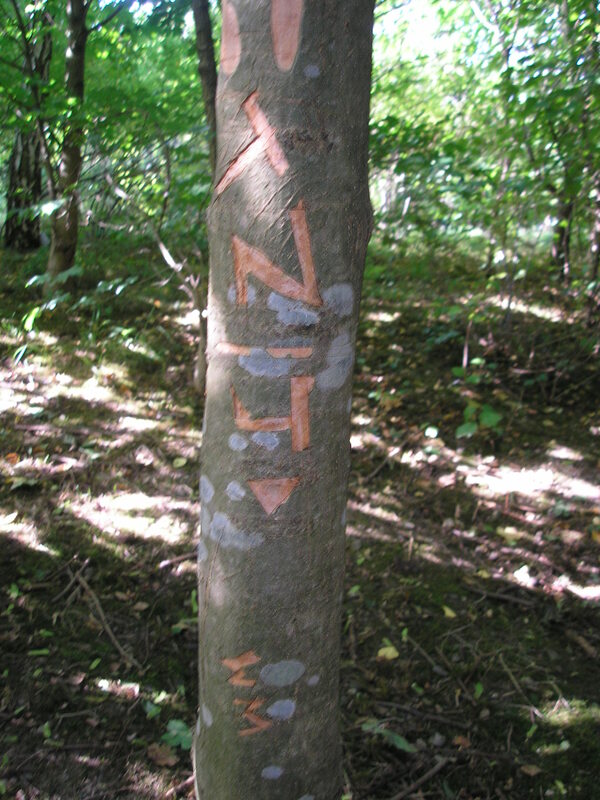 Three healthy Field Maples have had bark stripped and initials carved on the stripped trunks and elsewhere. 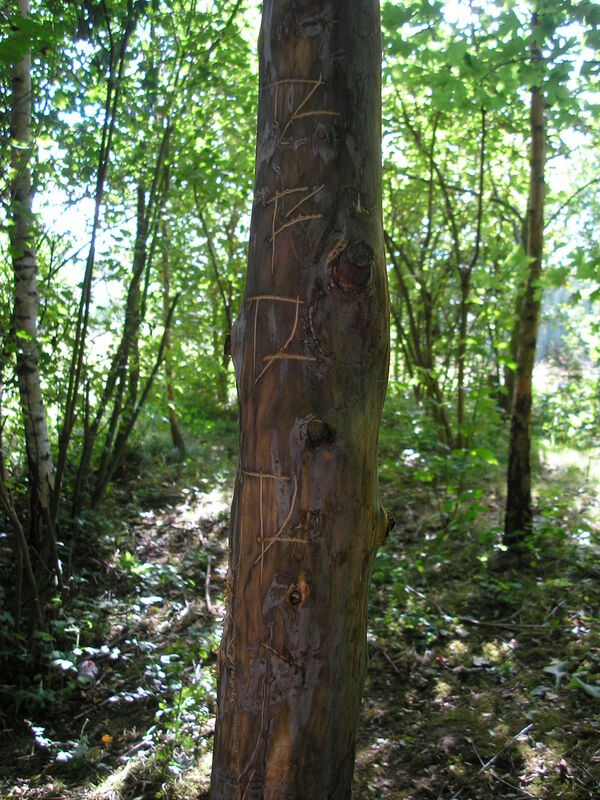 We’ve shown initials carved and if you can recognize any of them please us know so we can pass the information on to the police about this criminal damage, as the trees cannot be saved. The knife used is a real cause for concern. Do these initials mean anything to you? 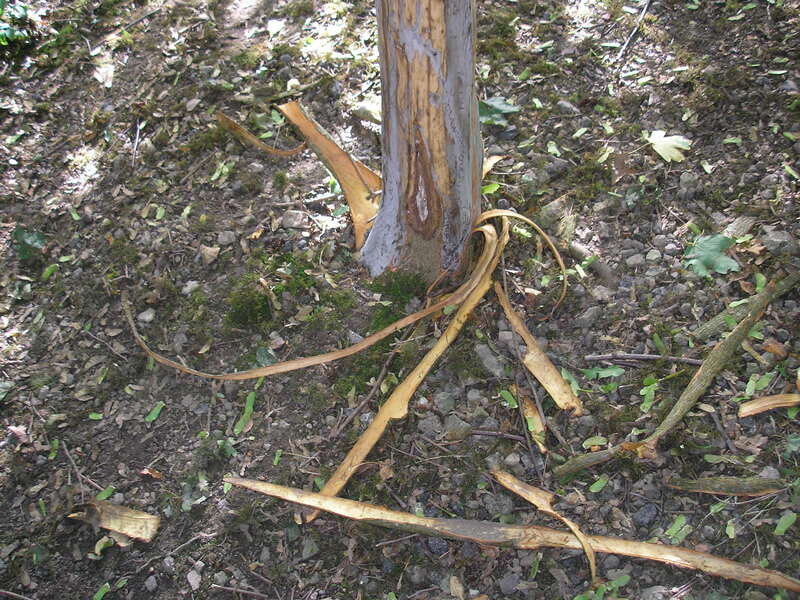 Some of the crack willows that drop leaves and twigs onto the path and overshadow more desirable trees are quite difficult to prune at height from ground level. 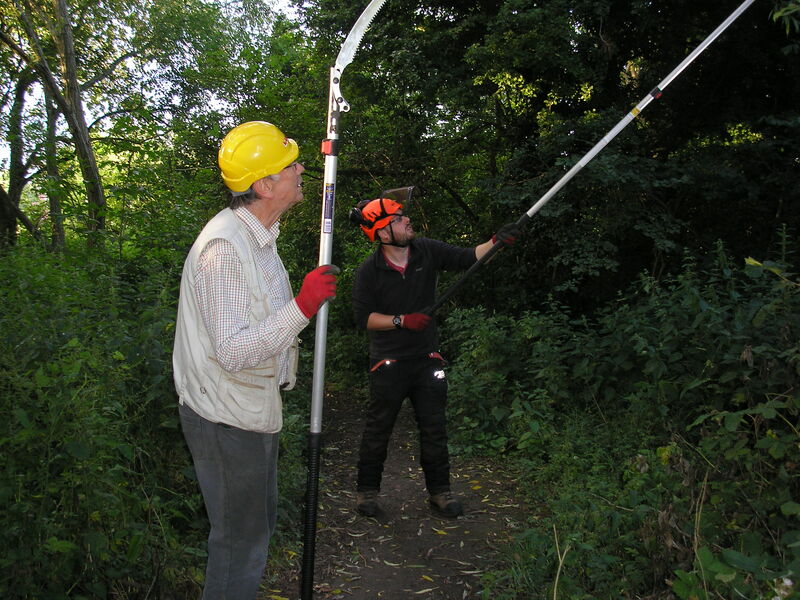 The field work co-ordinator recently acquired a 3rd Silky pole saw which extends our possible reach to a little over 21 feet above the ground. It works well though does require a bit more care and skill than our Silky 2-pole extension saws. 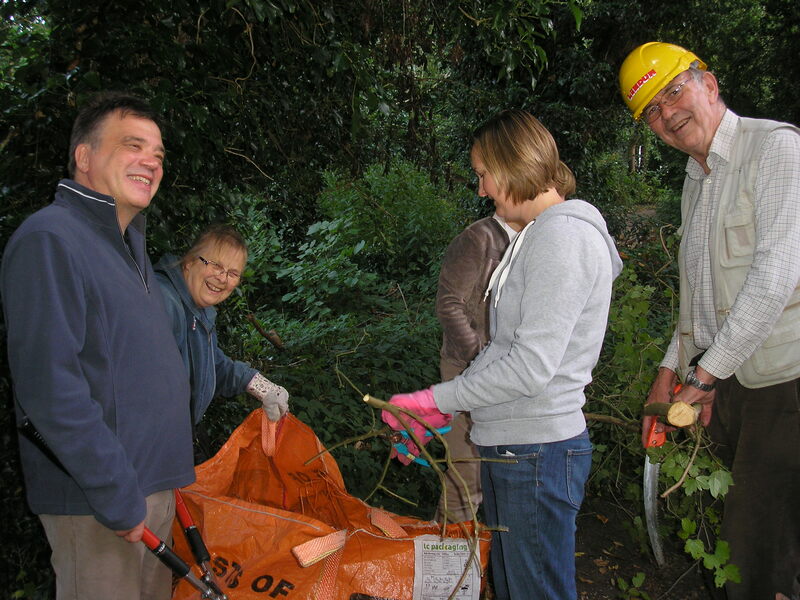 Thanks to Pam and Mike for the photos at our Thursday volunteer session on 20th August. 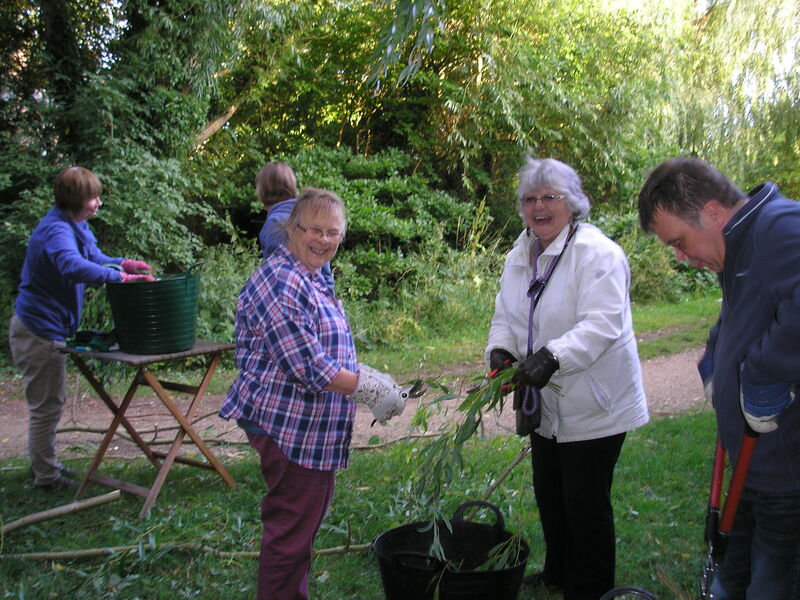 Thanks to Pam, Louise, Margaret and Lesley too for their invaluable help in cutting up the offcuts for composting later that day. Ben Malcolm & Louise cleared the rest of the area planted with bluebells the following Sunday, getting it ready to add a few hundred extra English Bluebells and grass in the area which is now much better lit. 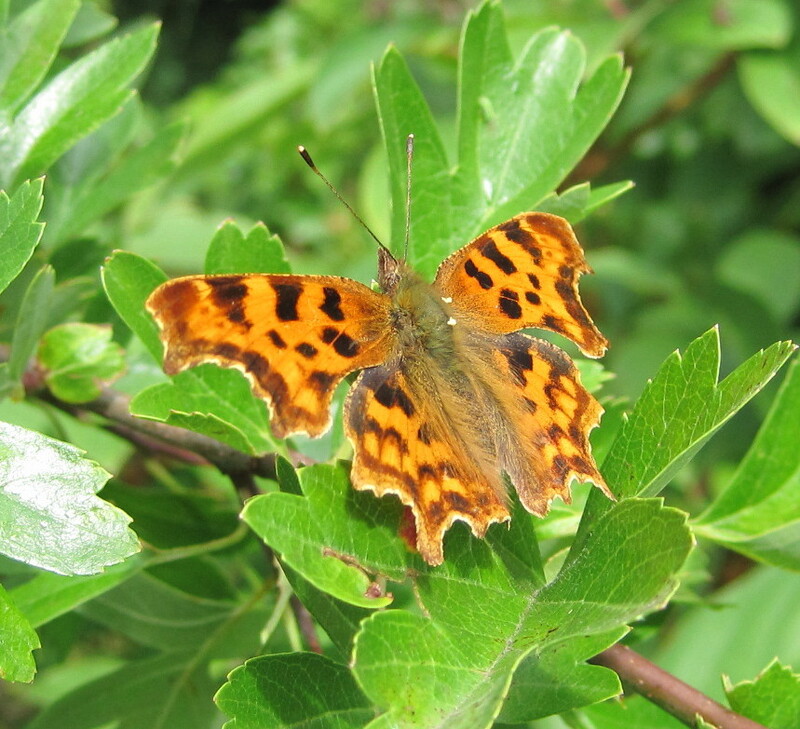 Several MCT volunteers are keen photographers of butterflies. 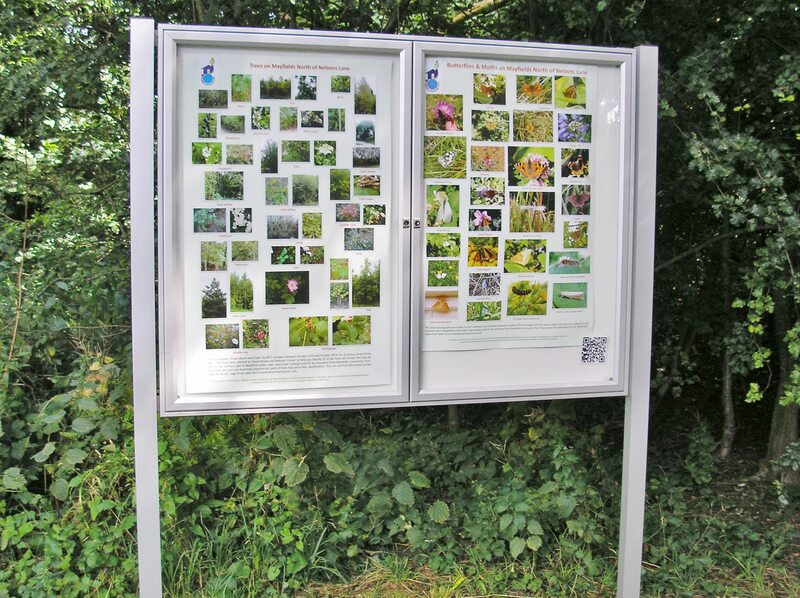 We thought their work would be of interest to a wider audience of Mayfields site users so have made a poster showing butterflies than can be seen on the site for one of the information boards. 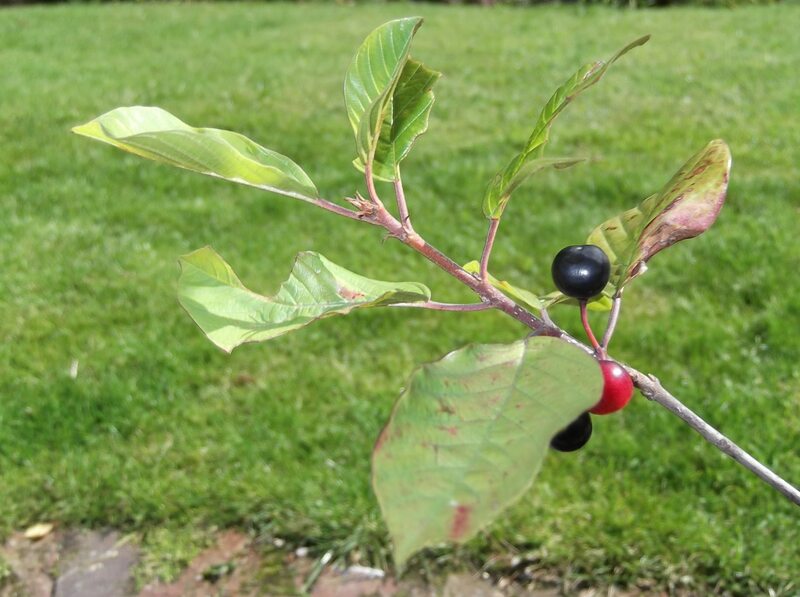 We mentioned back in February that MCT had been given 4 buckthorn tree saplings by Mark Tyszka from Friends of Hob Moor. 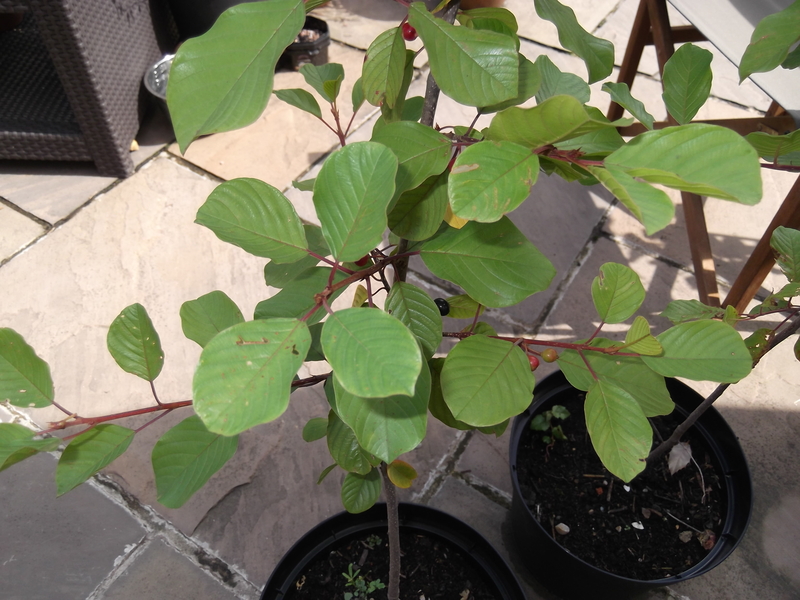 They are potentially very attractive to Brimstone butterflies, The field-work co-ordinator has grown them on in 10-litre pots in his garden, as shown below, and they have come on well so we will plant them out on the site in September. 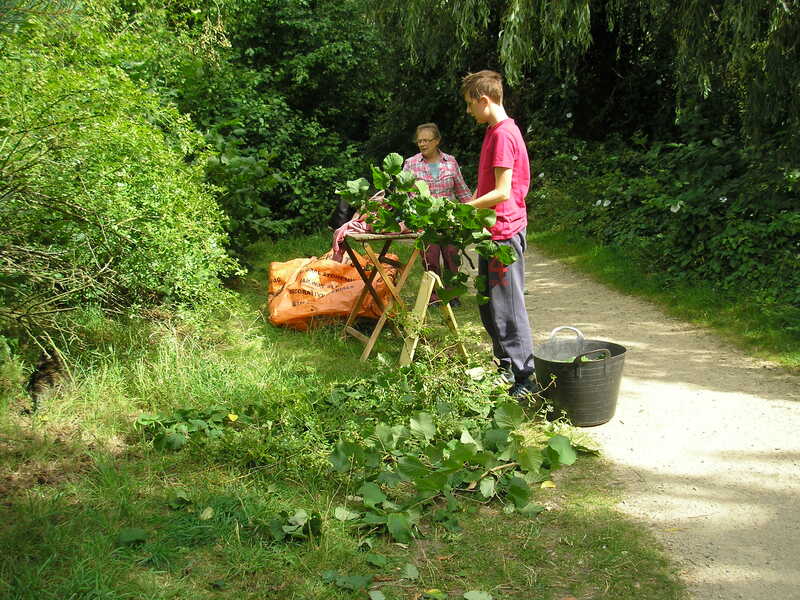 Ben, Louise, Malcolm, Pam and Margaret spent a pleasant hour and a half on Sunday morning reducing the height of Hazels and overgrown roses that were starting to damage lower branches of Scots Pines west of the path. 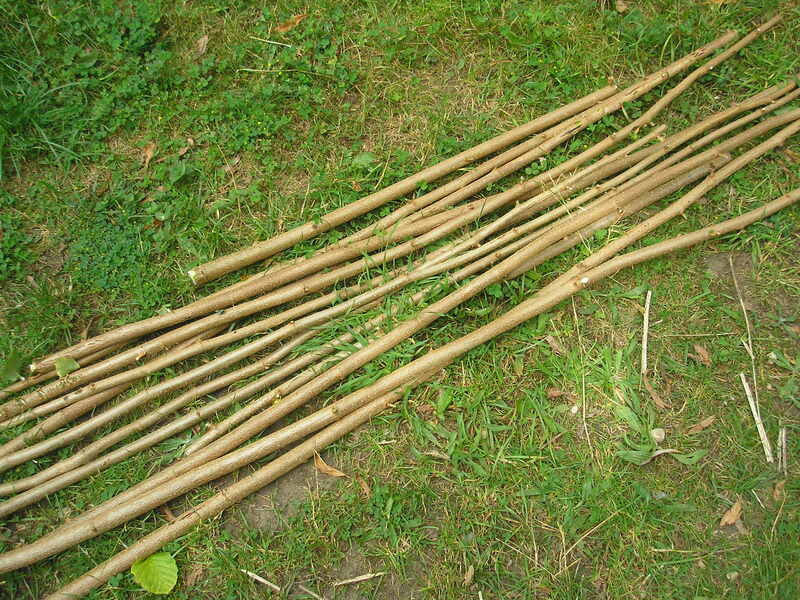 Straight hazel offcuts are left for anyone who wants to use them to stake garden plants. 6 MCT volunteers continued with this work the following Thursday (August 13th) and mowed the grass verges at the north end of the site, yielding 6 sacks of material for composting. MCT were pleased to welcome Adam Cousins to their first volunteer evening session in August. 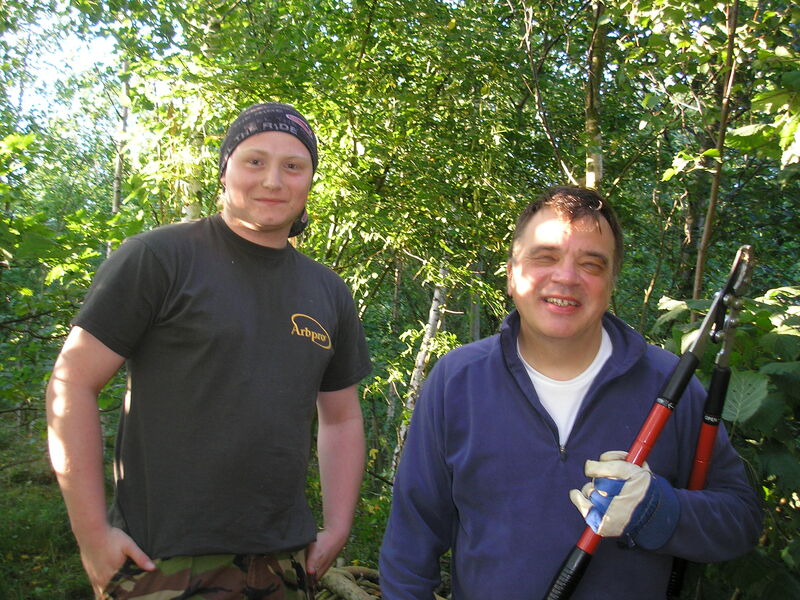 Adam (below left) is now working at Mayfields alongside Dave Moore, a Fellow postgrad student from Askham Bryan. 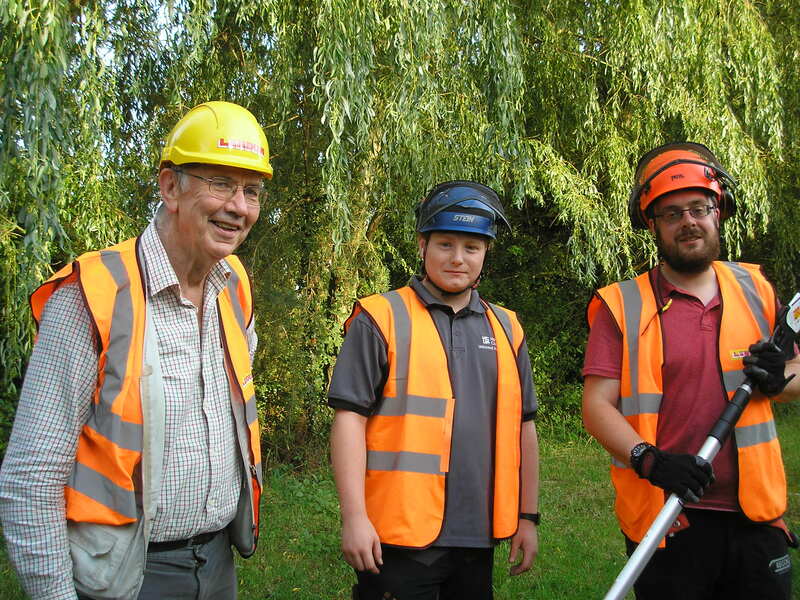 However both worked on the site with the field work co-ordinator for 8 hours, gaining very hands-on work experience. 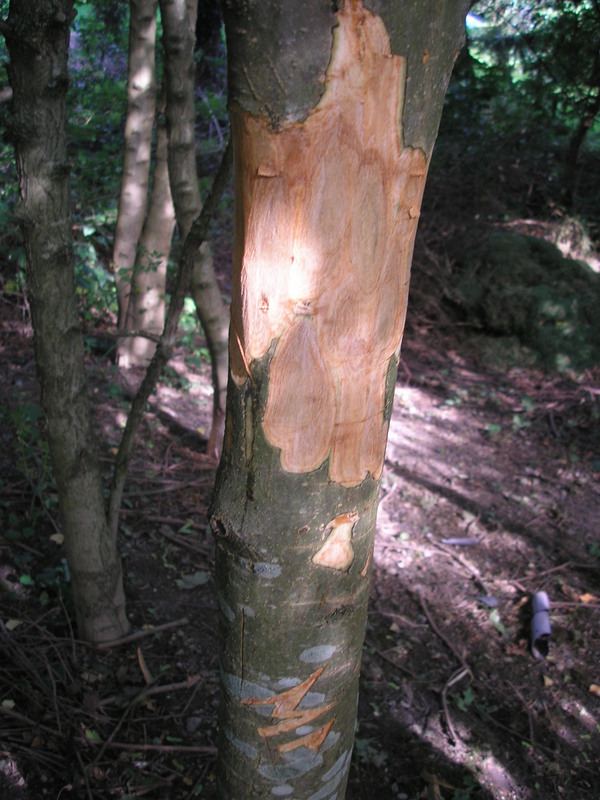 They cut down one heavily diseased crack willow near the playground and pollarded another which was generating potentially risky overhang over the playground. Paul (below right) joined Adam and Dave in the evening, along with Margaret and Pam, to help cut up the trimmed material for composting on site. Meanwhile Louise and Lesley helped Malcolm finish levelling, and removing building rubble from, the area behind the houses at the Nelsons Lane end of Hobmoor Terrace. This area has been seeded with grasses to facilitate future management by periodic mowing so we’re hoping for some rain over the next few days. Eight volunteers turned out for our session on Thursday July 30th. Our pole saws were put to good use in trimming the vegetation overhanging the paths, which helps minimize humus accumulation and muddy puddle generation. It also helps keep the path lighter to walk through in the early mornings and the evenings as winter approaches. It was good to see Margaret and Louise, the MCT Chair and Secretary, and other volunteers particularly enjoying completion of the work planned. As ever Pam caught the moment on camera. Don’t forget to look at our “Butterflies” page. We’ve added several more photos recently from Pam, Mike and Tina. 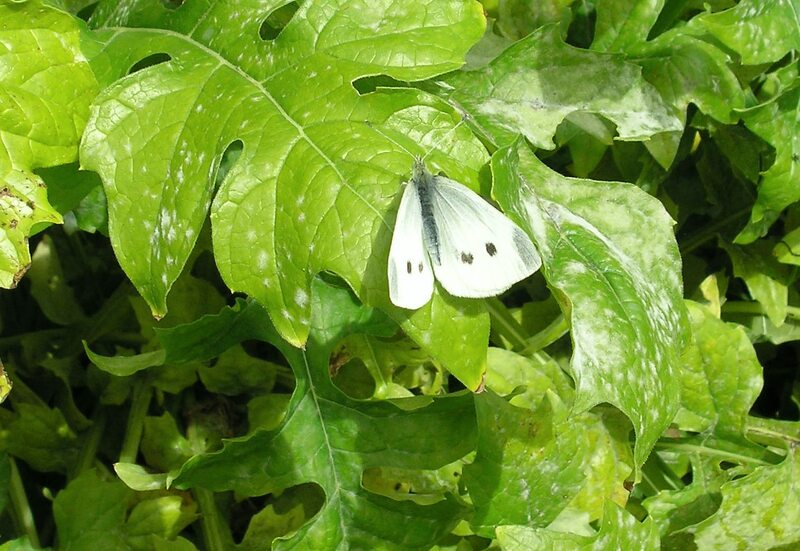 There were numerous small whites and commas around at the weekend. 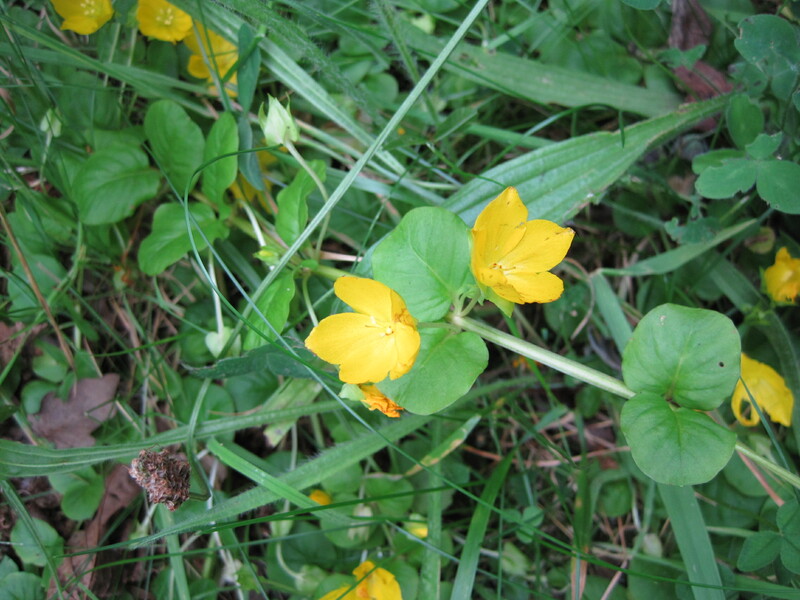 There’s an attractive patch of Creeping Jenny beside the path behind the west bund this year. 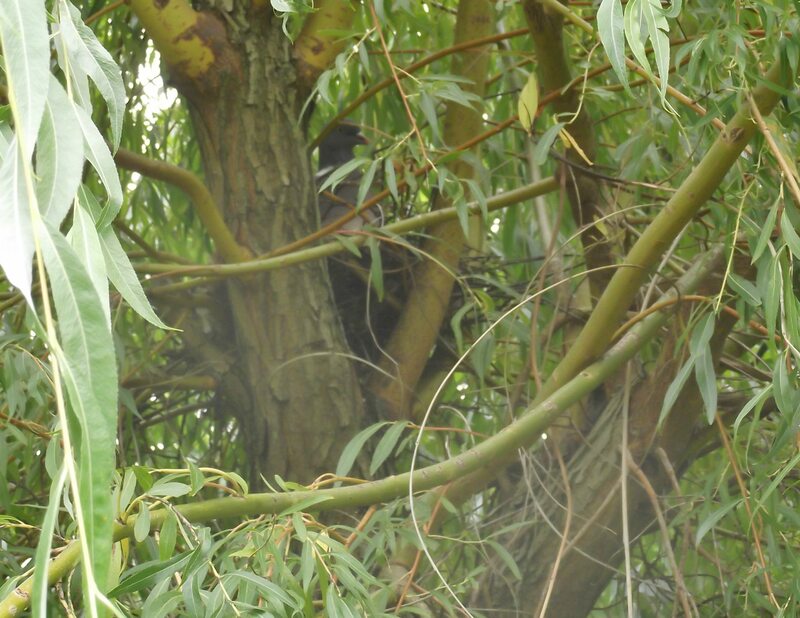 If we have to trim trees at this time of year we always check very carefully for bird nests. The opportunist pigeon below had neatly exploited one of the crack willows we pollarded last year to provide a very sturdy nest support. Mike Ridealgh, an MCT Trustee, spent a couple of hours photographing butterflies on July 23rd 2015. 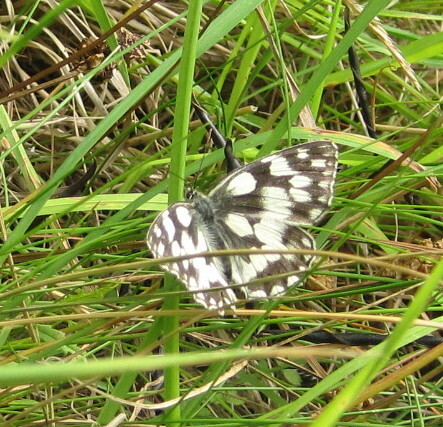 This is the first time we have seen a Marbled White on the site so it justifies its place here. Other species also photographed have been added to the butterflies page of the site. We were delighted to have Tina join Malcolm, Louise, Pam, Lesley and Paul at our Thursday evening volunteer hour and we made good progress with on-going work on reducing excessive competition between tree species on the west bund. 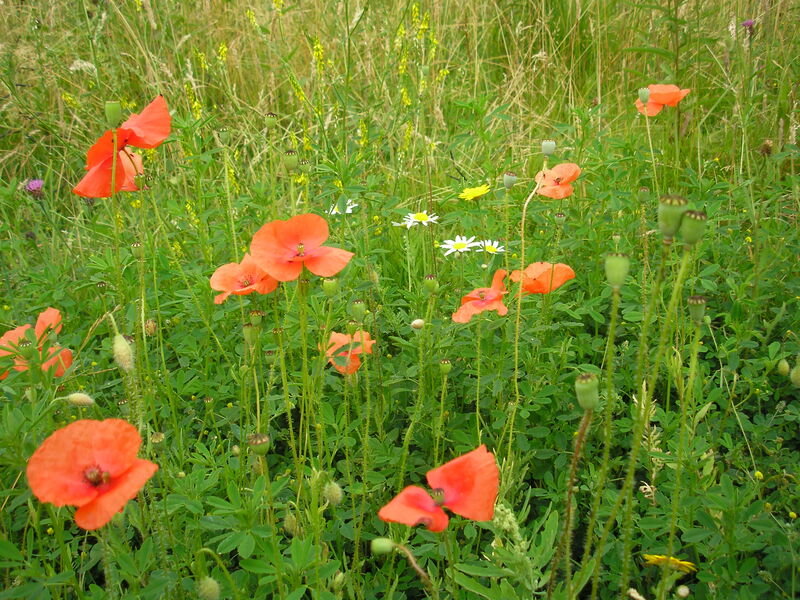 Small but beautiful – the Kew Grow Wild patch planted by our younger volunteers as Pam’s photo taken on July 22, 2015 shows. 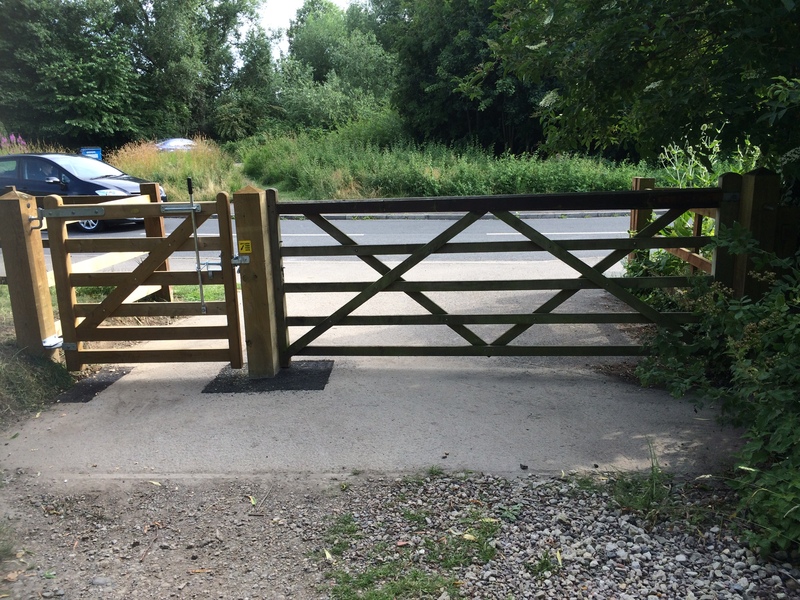 The new gate at the entrance from Nelsons Lane has now been successfully installed by a skilled group of contractors taken on by CYC. 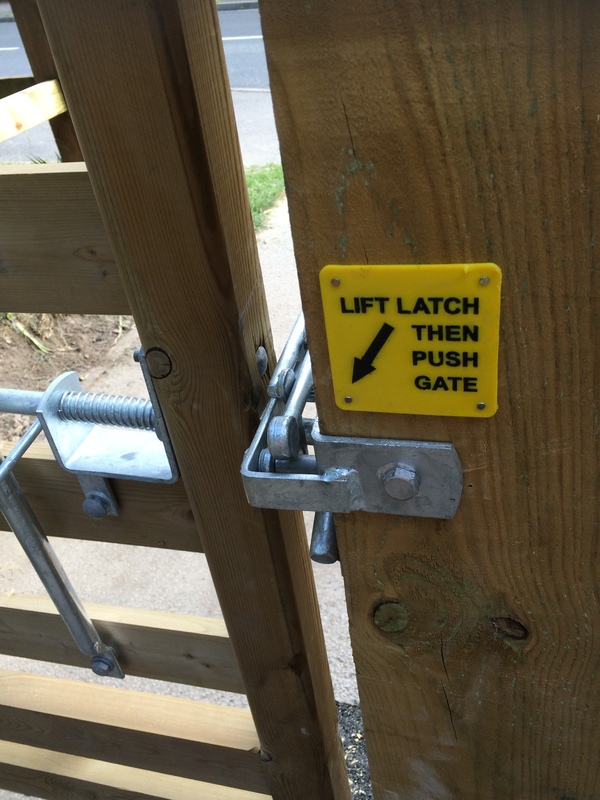 It is a foot wider than the old gate, opens in either direction, and closes automatically. As Margaret’s photos below show, it can be opened by a lever similar to that used before, or by using the automatically closing latch. 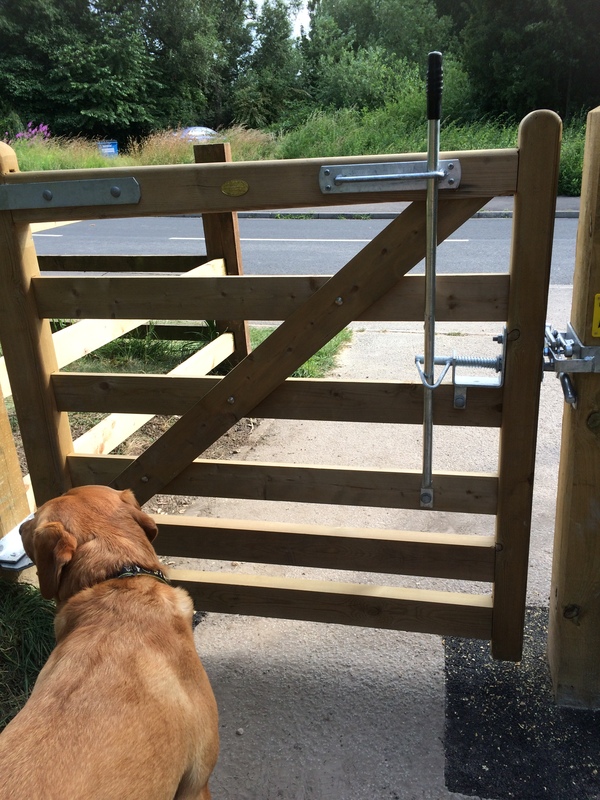 The third photo shows Angus posing beautifully to show why a self-closing gate was needed to prevent dogs or small children running straight out into the road. Pam Brown took an excellent photo of the gate from the Nelsons Lane side. It shows what a neat finish the installers produced when they moved the side fence back by a foot. 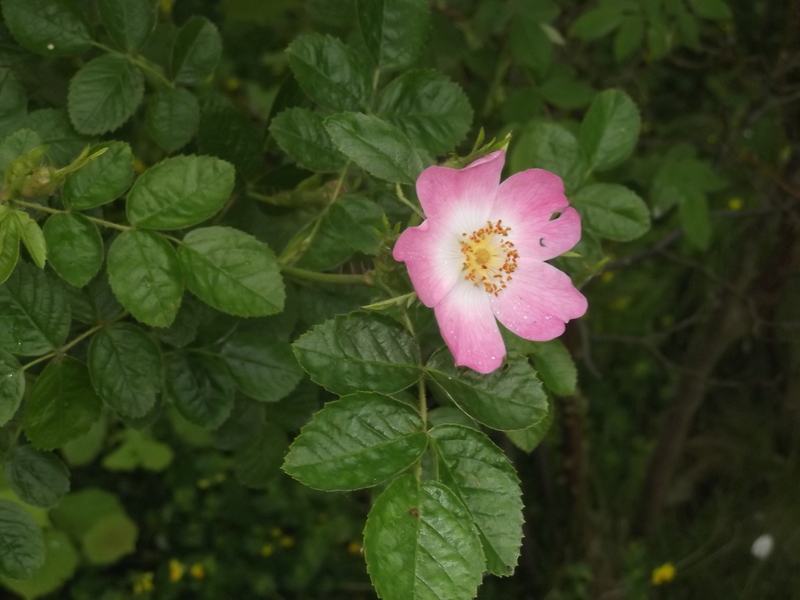 A couple more species have bloomed on our area of Kew Grow Wild seeds on the meadow, though they’re not that easy to find because of vigorous competition from the native soil seed stock. 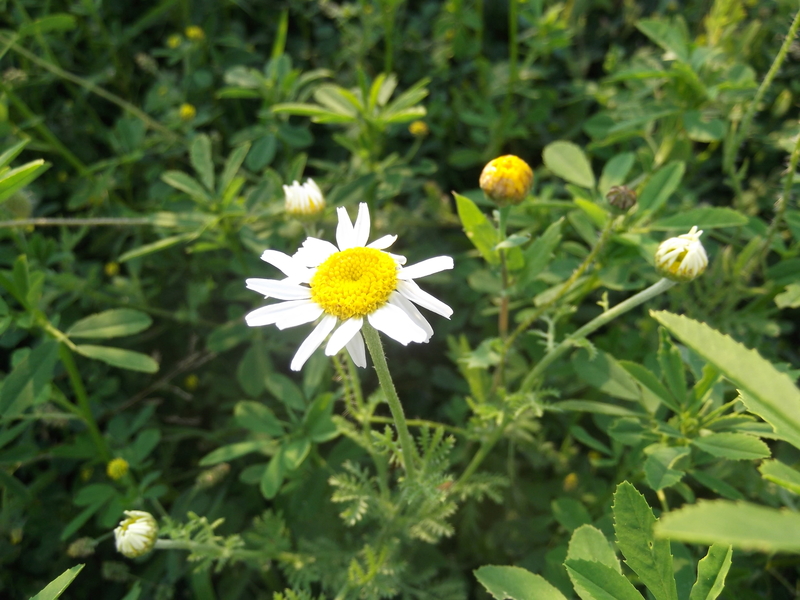 Photos below show Corn Chamomile (left) and Corn Marigold. 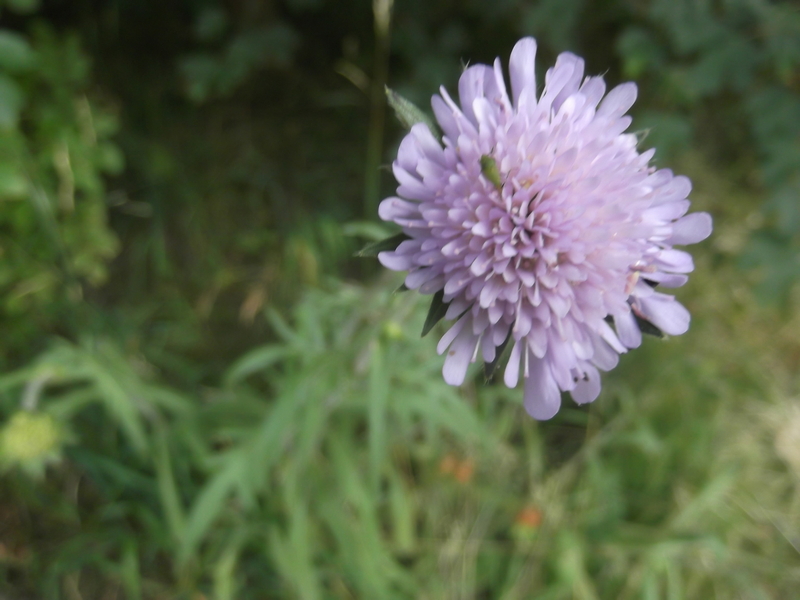 It’s nice though to see some old friends from last year re-emerging this summer, including the Scabious on the east side of the path and the St John’s Wort on the west bund. 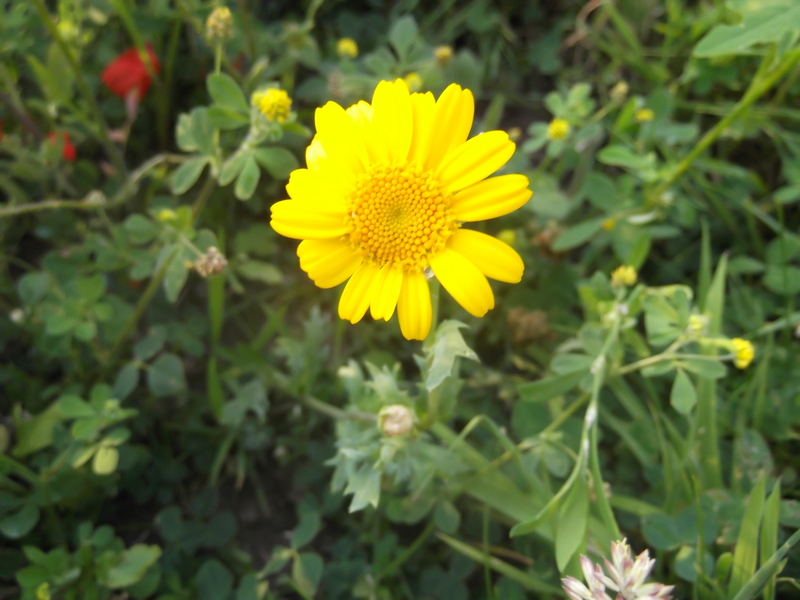 There has been a lot more Ribbed Mellilot this year, and in patches it looks quite spectacular. 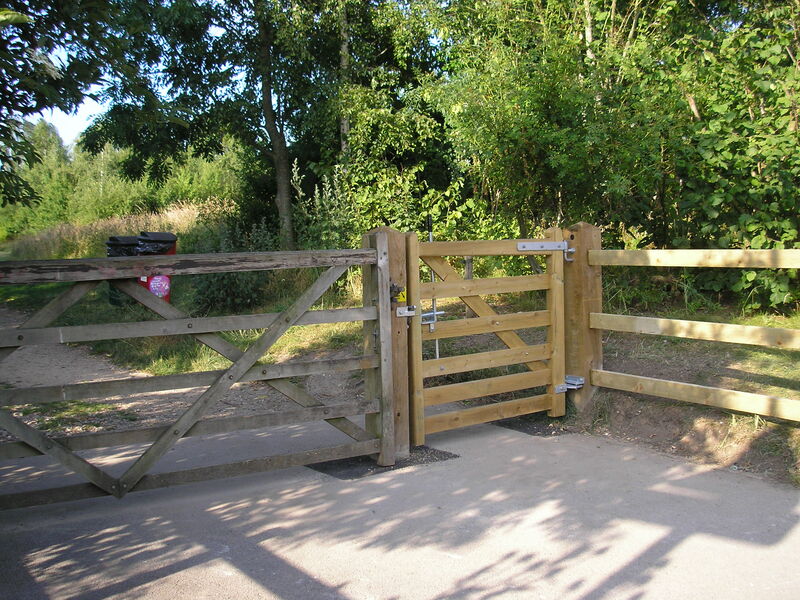 The new automatically closing gate is being installed by CYC contractors. 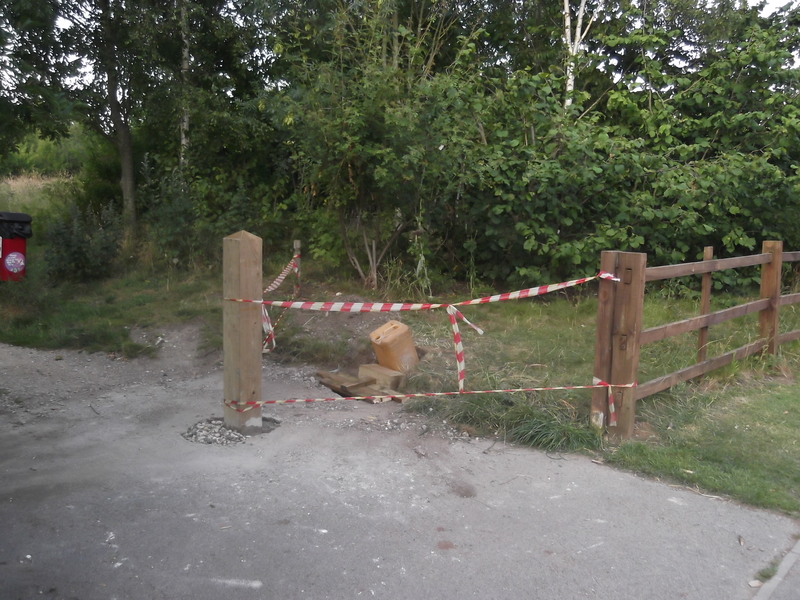 Installing the first of the new larger gateposts proved to be a real challenge because of the nature of the impenetrable material that makes up the sub-soil. Hopefully their hard work will be well worth it in the end. 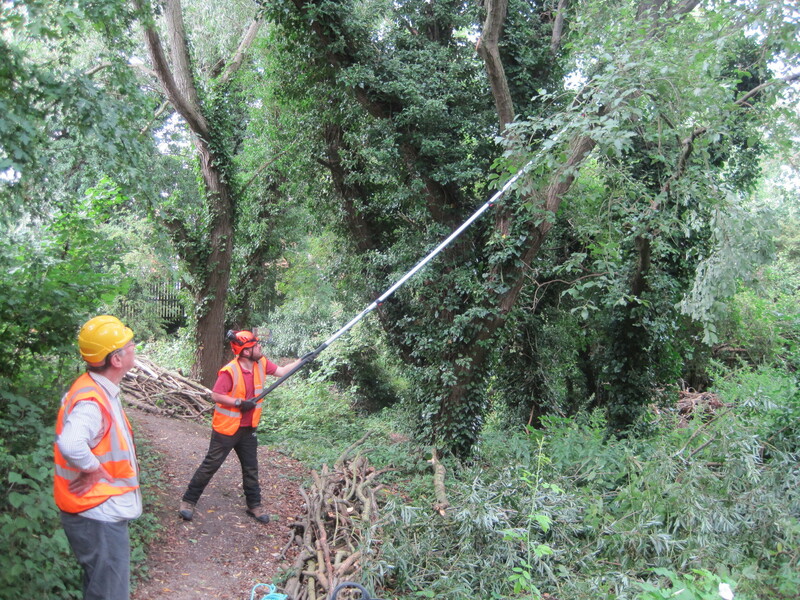 In the first 2 weeks of July, 2015, MCT has been concentrating on clearing massively overgrown marginal areas behind houses along the Nelsons Lane end of Hobmoor Terrace. 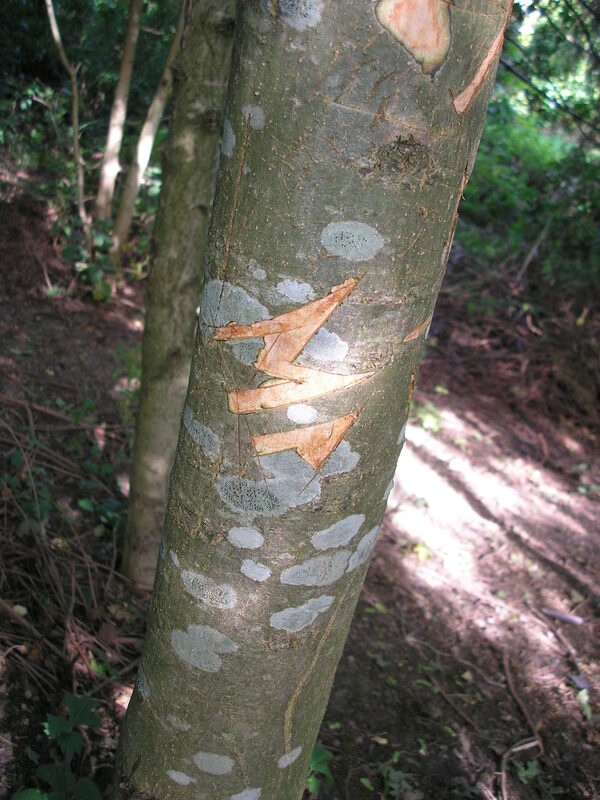 This was after consultation with local residents, some of whom were being seriously adversely effected by years of nature having been left to its own devices. 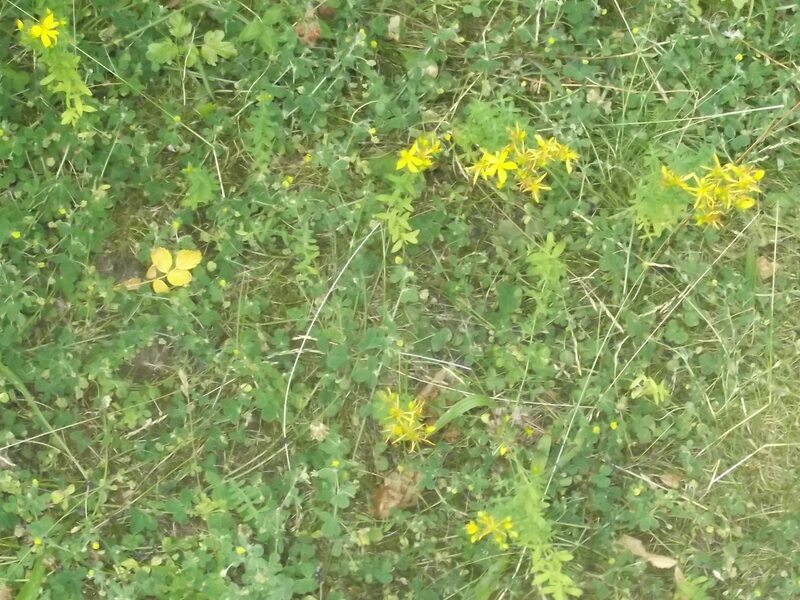 Incidentally the bright yellow of the Ladies Bedstraw on the land adjacent to Nelsons Lane is back and even better this year than it was for the Grand Depart in 2014!! 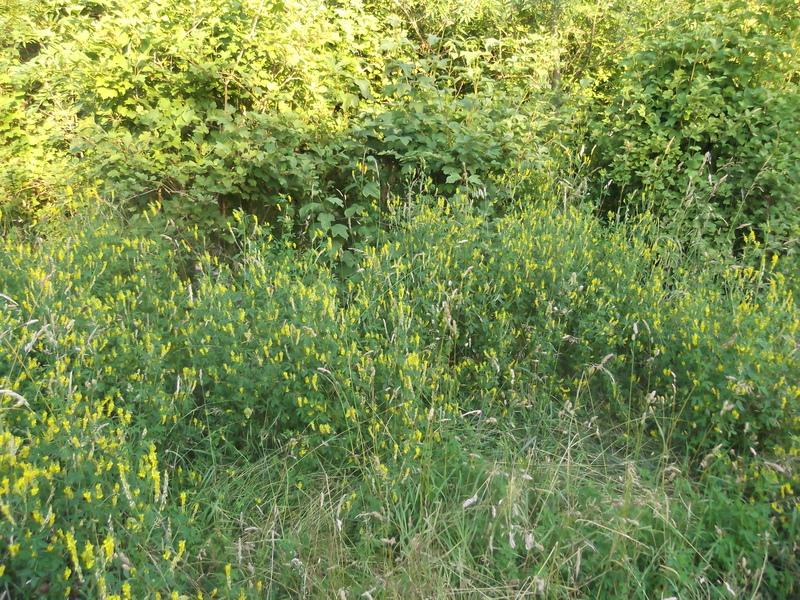 Pam Brown, MCT’s intrepid photographer, penetrated into the meadow on 9th July to photograph the area re-seeded with Kew Grow Wild seeds earlier in the year. I think you’ll agree when you see the poppies her effort was worthwhile, as they are too short to be seen from further away. Down on the meadow on July 3rd we were surrounded by Tortoiseshell butterflies. 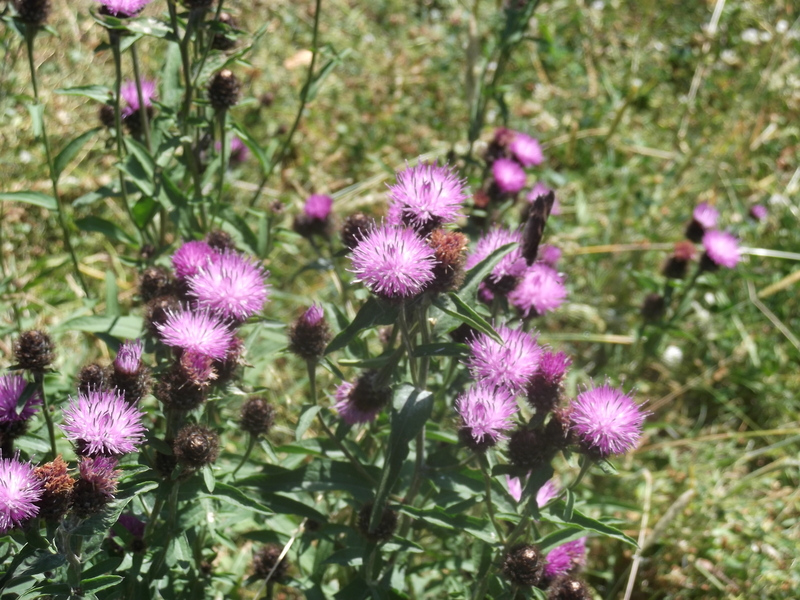 Alas we only caught one on camera, on the Knapweed, and it opened its wings just in time to be too late for the photo below! 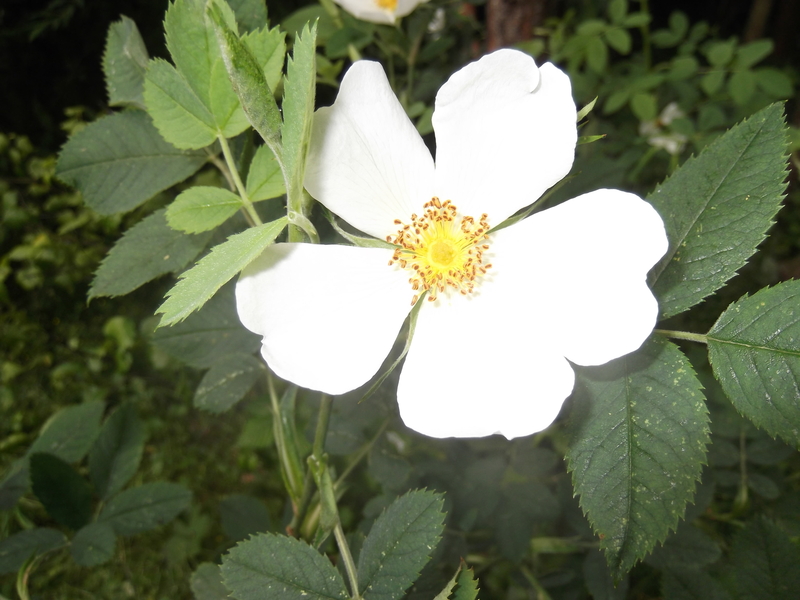 One of the many attractive features of Mayfields in July is the abundance of roses. You should easily spot at least 3 types. You might also notice selective mowing to help maintain habitat diversity at various points around the site, though some is to protect (i.e. 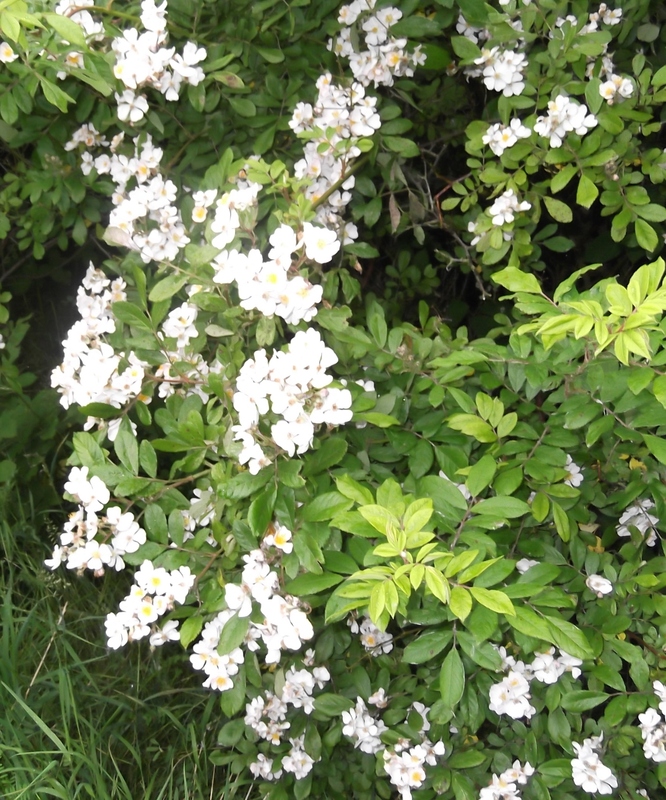 improve conditions for) recently planted trees and shrubs. 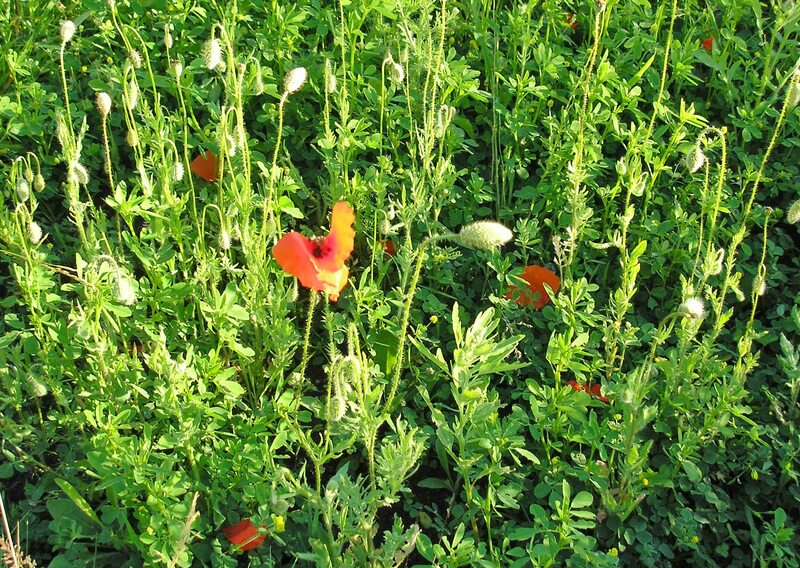 There are now some buds on the poppies from the Kew seeds planted earlier in the year, but growth is very slow due to the prolonged dry weather.